I always think there are like 4,324,567,906,011 colors out there, unless I’m trying to paint something, then there seem to be none. We are painting our house. It was in bad shape prior to last winter, but the snow and ice practically tore it apart and we realized we would have to shell out the cash to put it back together. I thought this would be exciting and fun, but guess what? Finding a color seems to be like finding a needle in the pile of clothes that’s usually in a pile in the middle of my son’s room when he is home, with your hands tied behind your back and your eyeballs closed. Plus it’s not like we’re going to paint it again anytime soon, so the stakes are sort of high in picking the right color. Plus plus, my neighbor and I (on account of we’re an attached side by side house) have to make the choice together. So it’s a pretty important decision (no pressure, not like deciding on the Iran deal or anything). But it feels like we might as well try and negotiate world peace while we’re at it. Heading to the paint store for another round of experiments. Maybe today will be the day. Fingers crossed. Grateful to be able to do this, not quite as grateful about the process. Amen. 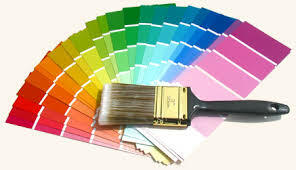 just painted my house-i have a lot of samples if you would like them. And great choices. what color did you paint it, Faith?